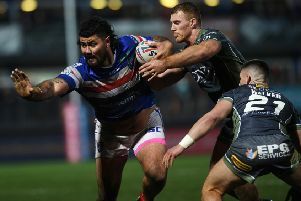 Wakefield Trinity Wildcats head coach James Webster admits that his team’s struggle with injuries will continue for the short term. Webster saw his under-strength team outclassed 52-10 by Wigan Warriors on Friday and Trinity’s struggle to get a squad out could affect their Easter programme. The loss of Danny Kirmond and Tim Smith in the build-up to the trip to Wigan left Wakefield with just 18 players and they had no answer to the hosts. Tries from Liam Farrell, Tony Clubb, Dom Manfredi and Anthony Gelling put Wigan 26-4 up at the break, Chris Riley replying for Trinity. Paul McShane also crossed for the visitors on the resumption but Manfredi, Farrell and Lee Mossop touched-down to extend Wigan’s lead. Gelling scored another two to complete his hat-trick. After the game, Webster said: “We did some good things well but were well and truly short in a couple of others. That is to be expected. We were well and truly out-matched. We were lacking experience today but I thought we tried hard.